Westbound: Take I-90 to Exit 17 (US-12/US-20/Dunes Highway). Continue West on Dunes Highway. Stadium will be on left. Eastbound: Take I-90 to exit at Broadway Ave. Turn right on Broadway Ave. Drive two stoplights to 5th Ave. Take left on 5th Ave. Stadium will be on left. Take I-65 North to end of highway at U.S. 12/20 [Dunes Highway]. Turn left on U.S. 12/20 heading west for 1.5 miles (three stoplights). Stadium is on left side. Take I-80/94 to I-65 North, all the way to end of highway at U.S. 12/20 [Dunes Highway]. Turn left on U.S. 12/20 heading west for 1.5 miles (three stoplights). Stadium is on left side. U. S. Steel Yard is easily accessible by bus or train. Train [Chicago - South Bend]: The South Shore Line runs daily from downtown Chicago to South Bend, Ind., with a convenient stop just outside U. S. Steel Yard. Just take any South Shore Line Train to the Gary Metro Center spot, and walk one block east on 4th Avenue to the front gate! Bus: The Gary Public Transportation Corporation has buses running throughout Northwest Indiana, including stops in Merrillville and Crown Point. Convenient stops are available just outside U. S. Steel Yard. Parking at U. S. Steel Yard is FREE year-round and available within comfortable walking distance of the front gate! 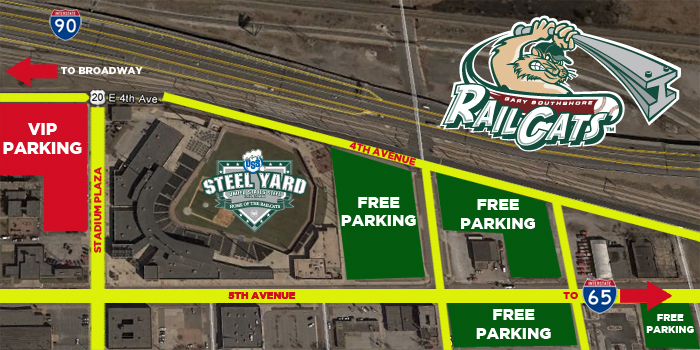 The RailCats main general admission lot is located next to the Diamond Club just to the east of U. S. Steel Yard. The lot can be accessed from either direction by turning onto Virginia Street off 4th and 5th Avenues. Parking is also available to the east and west of the stadium off 4th and 5th Avenues and just south of the ballpark. The RailCats V.I.P lot for Season Ticket holders is located on Stadium Plaza Drive adjacent to U. S. Steel Yard and is only accessible with a V.I.P. Parking Pass. For more information, contact the RailCats at 219.882.2255.